There are many awesome things to do in Atlanta, GA. But, there may be some days where you want to get out of the city and spend the day outdoors. Read this post for some of the best hiking spots near Atlanta, GA! 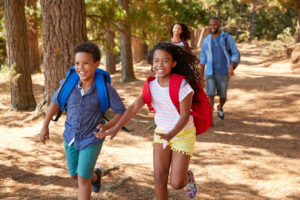 Whether you’re looking to get away from the city for a few hours, or spend a weekend outdoors, these hiking trails near Atlanta, GA are sure to please. Check them out! Arabia Mountain Top Trail is located just 30 minutes from Midtown Atlanta. When you hike the Arabia Mountain Top Trail, you will see both the Arabia Lake and Arabia Mountain’s scenic summit. This trail is safe for both beginners and kids. The Sawnee Mountain Indian Seats Trail is a relatively moderate 4-mile trek. The summit of Sawnee Mountain has one of the best views in North Georgia, overlooking the North Georgia mountains. This trail is only part of the 900-acre stretch of the Sawnee Mountain Preserve. Sope Creek Trail is one of the most popular parks in the Chattahoochee River National Recreation Area. On this hike, you will see the ruins of a stacked stone paper mill from the Civil War era. The once functioning paper-mill now looks like the ruins of an ancient castle. When you hike the East Palisades Trail at the Chattahoochee River, you will be treated to some of the most scenic views of the Chattahoochee River in the Atlanta area! The trail follows along the Chattahoochee River and leads you through a bamboo forest. This area is also popular for kayakers. Not only is the hike along the Pine Mountain Trail breathtaking, so is the drive up. The trail offers a gorgeous view of Lake Allatoona, Stone Mountain and Kennesaw Mountain. The trail is around 4.5 miles long and is rated as relatively moderate. Along this trail, you can expect to see forests, streams and large granite outcrops. This trail is also dog-friendly. Storage World has storage facilities in Stockbridge, Jonesboro and Decatur, GA, nearby Atlanta, GA. If you live in Atlanta, GA, you may not have the space you need to store your outdoor items, like tents, hiking equipment and kayaks. If this is the case, consider a storage unit rental with Storage World. Storage World has 5×5 and 5×10 storage units, ideal for the storage of outdoor items. Stop by one of our storage facilities or contact us to rent a storage unit today!